Minicamp Over, So What’s Next For The Bills Players? By the end of next week, all NFL clubs will have completed their off-season programs and they have five to six weeks off before reporting to training camp. The misnomer here is “off”, as no NFL player in today’s game can afford to take more than a few days off as he prepares for training camp. Years ago training camp was used to get players in shape and ready for the season. That was one of the reasons double sessions took place and the NFL had six preseason games for each club. With the the off-season programs and OTA’s coming into play in the late 1990’s, coaches began offensive and defensive installation during the off-season programs as well as the physical preparation for the season by the players. Players come into camp in top shape and ready to go. Up until 2016, the last week of June was used for the Rookie Symposium that was usually held at the Pro Football Hall of Fame in Northeast Ohio. During that week all the drafted players would attend workshops to learn about life as an NFL player both on and off the field. They would learn very simple things such as how to handle money and how to interact with both fans and media. They also learned about what was expected of them as NFL players in regards to their team, the League and their community. In recent years the NFL did away with the League wide Rookie Symposium and now have each team conduct a Rookie Transition Period. This consists of daily classroom work for the rookies on many of the same topics that the Symposium covered. The difference is that instead of covering topics in a four to five day period, the transitions classes are daily for about three weeks once the rookies report to the off-season program. The old Rookie Symposium only included draft choices while the Transition classes include both rookies and undrafted free agents. With so many undrafted free agents making clubs every year, this was not only important but the right thing to do for each rookie. When the off-season programs ends each player is assigned a reporting weight for when training camp begins. Once camp begins in late July not only are the players expected to report in top condition but at a certain weight and in the case of many clubs, carry a certain percentage of body fat. On reporting day, each player is tested to see if they meet the reporting standards they were assigned. Those who do not meet the standards are usually gone fairly quickly. NFL players are no longer on scholarship, but rather have a signed contract and because of that expectations have to be met. While players don’t have contact with coaches during the “off” time, they are expected to work on skills that are part of their position grouping so that once camp opens they are ready to compete. For rookies it means studying their playbook almost on a daily basis as well as working on position specifics. Often the different position groups will meet on their own away from the team facility and have “uncontrolled” practice sessions. This may include the quarterbacks, receivers, running backs, defensive backs and linebackers getting together informally a few times a week and doing 7-on-7 sessions as well as one-on one’s. Often sessions like these happen at a local high school or college. There are some cases where a quarterback and his receivers will gather at a resort area and not only have daily workout sessions but also some vacation time. Regardless of where players gather, they know the importance of being prepared once training camp opens. When camp begins, coaches have very little patience for players who aren’t 100% both mentally and physically. So while the next four to five weeks may be “free” time for NFL players, don’t think for a second they aren’t getting ready to play football. For successful NFL players the only real “off” time is the period between when the season ends and the off=season program begins. 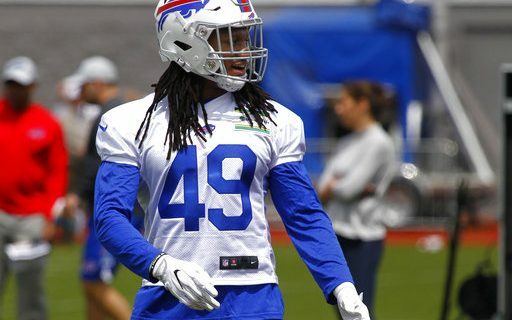 What second year Buffalo Bill will break out this season? Read Greg’s breakdown.